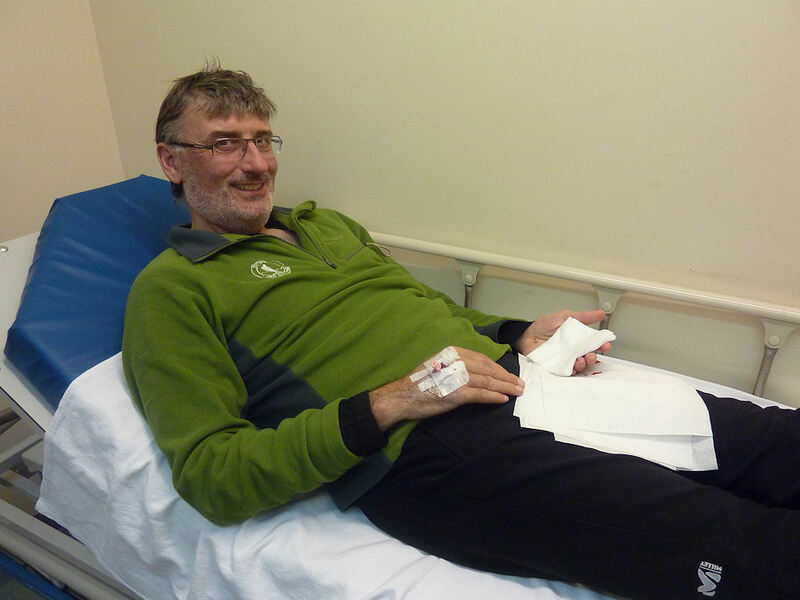 Readers of Martin Banfield’s blog, Postcard from Timperley, will have seen that Ye Olde Slowman suffered a rather misery-inducing injury to his hand earlier today, attempting to climb over a barbed wire fence in the Borders. A was almost over the fence when his foot, which was balanced on a piece of wire, slipped away below him, as a result of which he felt himself falling backwards. Instinctively he grabbed for the wire with his left hand, to stop himself from falling, but grabbing barbed wire with a hand when travelling backwards at speed isn’t a Terribly Good Idea (The Capitals Are Important Here, as I’m sure Alan would say), and the next thing we knew old Alan was lying on the ground with blood pouring from his left hand, and attempting to extract his first aid kit from his rucksack with the other one. Eep! The slick rescuing machine that is the Borders (Peebles to Moffat) Assault Patrol slid seamlessly into action, though, and while some people bandaged the hand, and attempted to make the wounded warrior comfortable and warm, others quickly brewed a mug of something hot, sweet and restorative, whilst still others shot off down the hill to retrieve a car with which to convey the fallen Slowman back to civilisation. Yet another managed to gather up the panicky little dog and fasten her down, to prevent her from chasing the runner into Moffat. 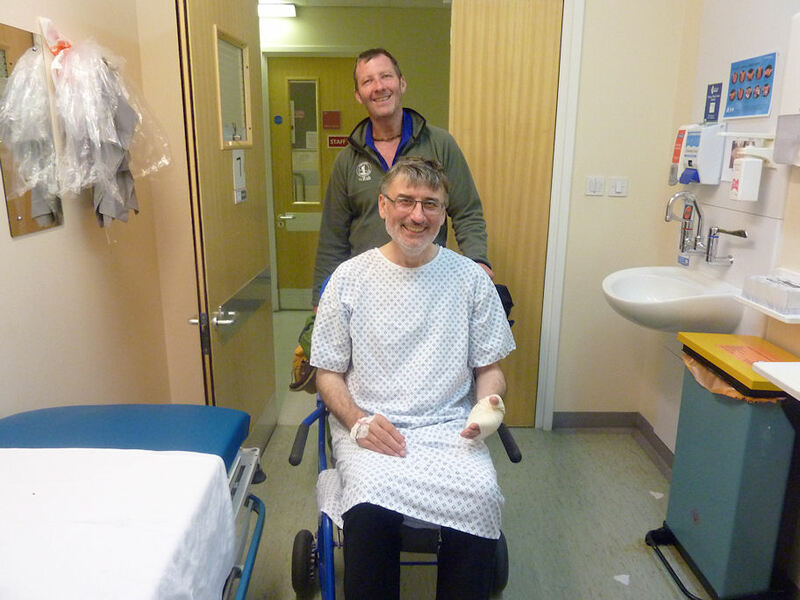 Anyway, at the conclusion of the rescue operation Andy Walker and I drove Alan to Carlisle hospital, where they set about putting him back together again. He has a pretty nasty injury to one of the fingers of his left hand (photos below: don’t scroll down if you have any kind of iffy tummy…), but as I write he’s tucked up warm, comfy and sleeping, I hope, in bed there on Beech Ward. The injury wasn’t the sort of thing that could be stitched up in Casualty, and so tomorrow morning the orthopaedic surgeons are going to clean it all out, and check for tendon and/or nerve damage, under general anaesthetic. Alan was very brave indeed throughout the whole miserable incident: at least a thousand times braver than I’d have been, in the circumstances. 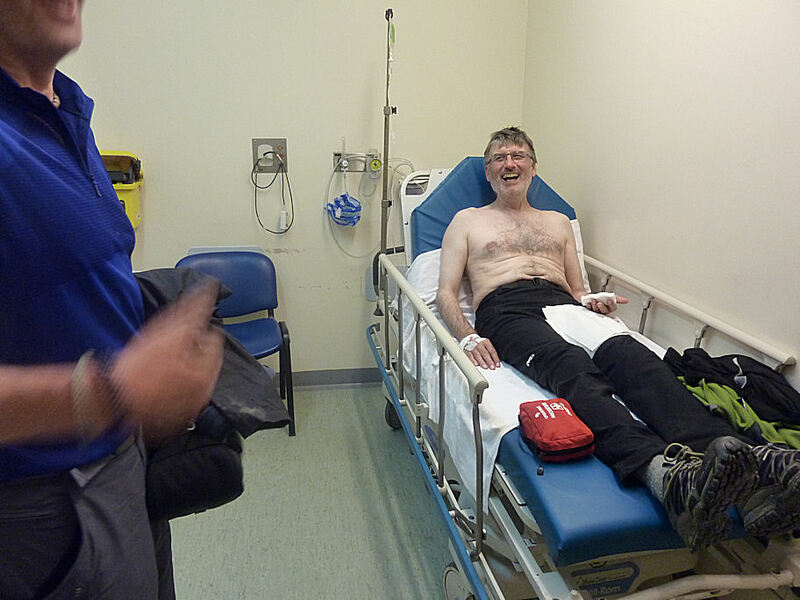 He managed to walk off the hill, and at the hospital he braved the insertion of one of those plastic thingies into the back of his hand (he doesn’t like needles), and a tetanus injection, and (worst of all) the removal of the bandage that we applied on the hill. I actually feel a little faint just thinking about it! Andy and I had to hold hands on the other side of the room just listening to the conversation from the direction of the sink 😦 A showed amazing fortitude, though. I was Extremely Impressed, and proud of him. Ultimately, I have to wonder what purpose the barbed wire was actually meant to serve on top of the fence. Was it just there to make things difficult for walkers? If so, it really served its purpose today. I’ll be carrying wire cutters in future, and I cringe, now, to think of the times I’ve clambered over barbed wire fences in the past. I knew they were dangerous, of course, but it was all just a bit theoretical until I saw the state of Alan’s hand this afternoon. Thank goodness it was ‘just’ his hand; it could very easily have been even more serious. 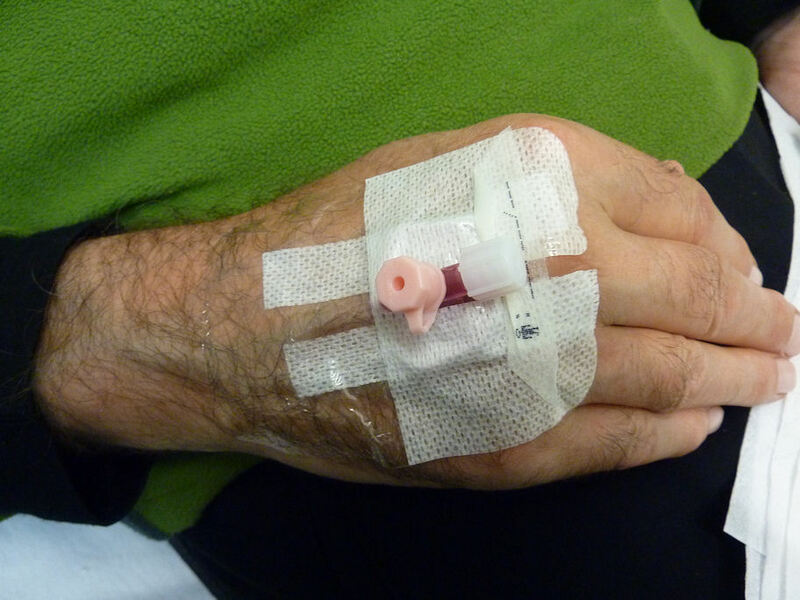 Alan’s hand will probably be okay, but we won’t actually know until after his operation tomorrow morning whether he’s done serious damage or not. Any good wishes/positive thoughts you can send in his direction will be extremely welcome. Piggly, GF and I spent a happy half day in Edinburgh a few days ago. The 3 of us are currently whiling away a couple of weeks in Ye Olde Scottish Borders, dog and house-sitting for pals, but by Thursday the truly dreadful and depressing Horribleness that was the result of my last hair cut had finally become Absolutely Unbearable, and so we nipped North along the A1 so that I could, if necessary, have my head shaved (believe me… even that would have been an improvement) whilst GF and Piggly stretched their paws and took in the interesting sights, smells and sounds of the big city. As things turned out, the hairdressery place was right next door to the famous Valvona and Crollas Italian deli and coffee shop, and I barely managed to suppress a squeal of excitement at the prospect of getting my crubeens on all that lovely food after the haircutting had taken place. So, we sat happily down outside at a table in the sun and ordered two coffees, to pass the remaining 15 minutes until my hair cut was due. It was a pity that the coffees didn’t arrive until approximately 20 micro-seconds before I was due at the hairdressers, but I assumed the delay had been the result of some unfortunate random hitch in the kitchen, swigged down the coffee (good job it wasn’t hot, then…) and trotted happily away to be sheared, promising to text Piggly and GF when the process was complete. When I emerged an hour later, though, I found P and GF still seated where I had left them. Apparently it had taken almost that long for Alan to order a piece of chocolate cake and a glass of red wine. He’d progressed through Mild Irritation to Monstrous Indignation, and had been well on the way to developing Incandescent Rage before he’d noticed that customers all around him were apparently experiencing similar difficulties. At that stage he’d settled back to watch, and the service had been so comprehensively awful that, by the time I returned, a large helping of schadenfreude had restored him to his more usual good humour. Not having an other hour to spare, we decided against risking another drink at V&C’s, and so set off to find lunch elsewhere. We weren’t sure where to go, but George Street was in bright sunshine and so we turned in. 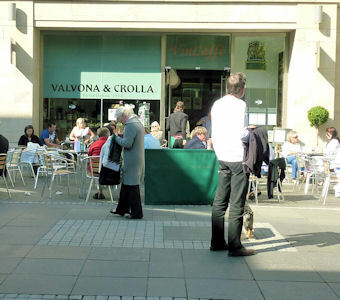 A little way along we came across a spare table outside the Tempus Bar & Restaurant. It didn’t look particularly flash, but what a revelation it turned out to be! 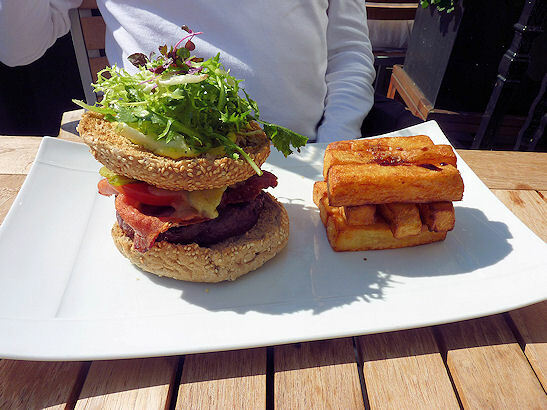 Tempus in George Street - Brilliant! 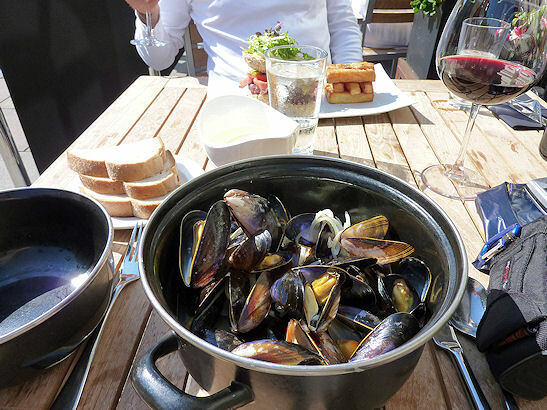 …and I had mussels in white wine, shallot and parsley cream, with plenty of crusty bread to mop up all the best bits (at only £6.75, the mussels were great value for a really delicious and filling lunch, I reckon). Mussels in white wine, shallot and parsley cream. Yum! Piggly is on a bit of a diet, and stuck bravely to a few mussels, a bit of lettuce and a small piece of sauce-soaked bread. We spent a happy hour, chatting and guzzling in the sun. Our waiter told us we were welcome to stay as long as we liked, but eventually we had to make tracks in order to take all three terrorists out for a good walk. 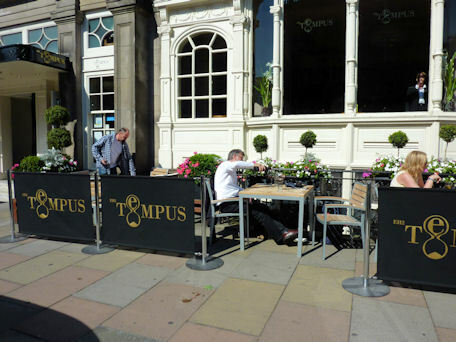 Next time I’m in Edinburgh I’ll definitely be making my way back to Tempus for lunch, coffee or dinner. I think I’ll be giving Valvona and Crolla a miss, though. You are currently browsing the Peewiglet's Plog blog archives for September, 2010.